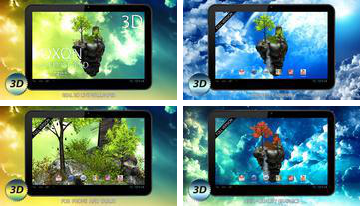 Appendix FlyIsland Free 3D Live Wallpaper is a new product from us already love the publisher decided to create a wallpaper of all kinds and colors, to win the title of best in the business and your heart, of course. This time to decorate your android you are invited to a colorful island that floats in the sky against the background of fantastic landscapes. Apocalypse is a terrible, tragic and needless to no one would catch him, but only if the apocalypse is not shown on the TV screen. 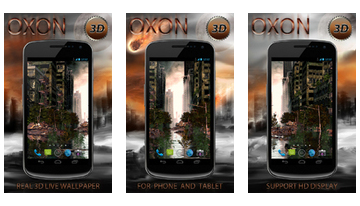 But the developers of OXSIONSOFT went a little further and you can now watch the real apocalypse on your desktop, you just need to install free wallpaper Apocalypse 3D Live Wallpaper! 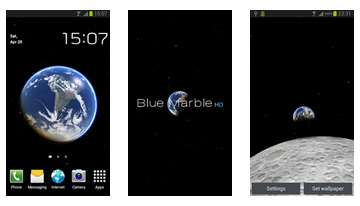 Live wallpaper for android called Blue Marble HD are available today for you, they are ready to transform your desktop look stunning on our home planet. Wallpapers are made with the latest technology and demonstrate the incredible beauty and power of modern graphics processors. Annex My Log Home iLWP is very interesting and exciting live wallpaper, filled with the soothing atmosphere of vintage log home, located away from the noisy city and a wonderful view of the mountains. 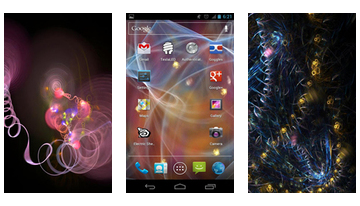 Wallpapers received a lot of awards for the beautiful graphics, a large number of settings and individual settings. Appendix Screen Speaker is the magic of music, which found visual representation on your desktop. Enjoy the magnificent sight - a vibrating speaker, it really is fascinating, and the realism of what is happening will allow you to capture the rhythms he beats off. 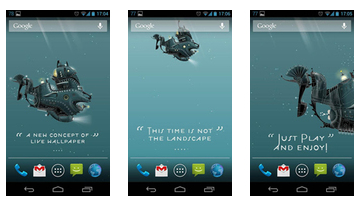 Appendix The Nautilus is a live wallpaper for the android, the design of which it was decided to withdraw from the accepted norms and do everything differently. For a start, these wallpapers do not represent any landscape, it's a full opportunity to be a passenger submarine Nautilus! 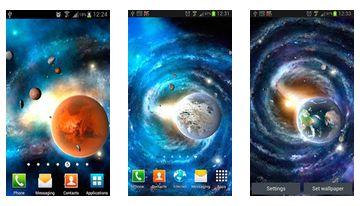 Appendix Solar System HD Deluxe Edition is a space live wallpaper for your android, very beautiful and made ​​in high resolution HD. In the next few months, the developers promise a lot of updates, so swing and settle wallpaper on your desktop for a long time! 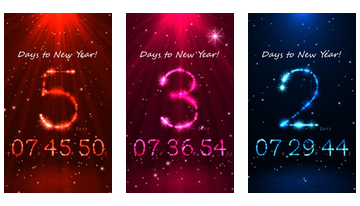 The program 3D New Year Countdown is a unique live wallpaper for your android, focused on the upcoming holiday, which is left up to less than a day. 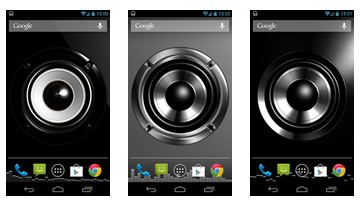 An important feature of the wallpaper is a countdown timer that measures the time remaining before the promised time. 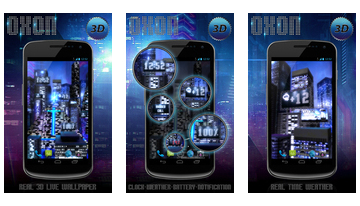 Application with the strange name Electric Sheep (Electric Sheep) is just a live wallpaper for your android with some nice features. For example wallpapers are the winner of an art prize, not bad for a start? 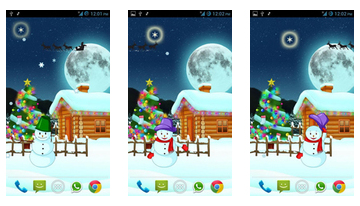 Magic Christmas Live Wallpaper is another attempt to prepare your favorite android for Christmas and the new year - namely, a beautiful live wallpaper. 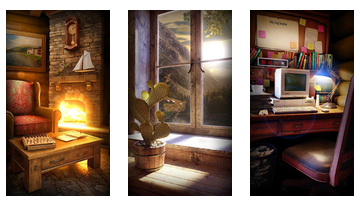 Make your desktop beautiful, interactive and magical at the end of it all.